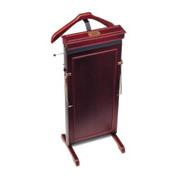 Black Trim only: Mahogany, Walnut & Black Ash wood effects. White Trim only: Coral Oak wood effect & White. Black or White trim: Oak, Pine, Siam Pear, Morello Cherry & Beacon Beech wood effects and Satin Chrome finish. We are pleased to quote for different finishes. Thermostat. Fitted with 2 metre power cord which exits the press at centre base. May be ordered to any length between 400mm and 2 metres. Moulded Plug. May be ordered without plug for spur fitting. The iron power cord exits on the right but may be specified to exit on the left. 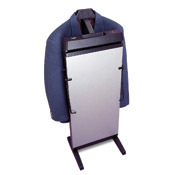 Trouser Press: 240v / 250w, 220v / 210w. 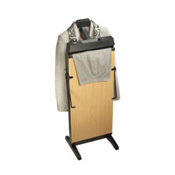 The favoured and neat solution to in-room guest ironing. 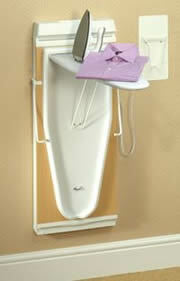 Complete with Dry Hotel Safety Iron with Auto-Off timer safety feature - 30 seconds horizontal and 8 minutes vertical. Variable height to suit all guests (including disabled). Hook for wardrobe hanging. Cord tidy. Quality, steel build for long-life. Metalised cover. Special Feet for enhanced stability. (We recommend one Ironing Centre per bedroom).